On October 25, more than 200 people gathered at Yeshiva University’s Wilf Campus for the Ninth Annual Fuld Family Medical Ethics Society (MES) Conference, presented by the Yeshiva University Student Medical Ethics Society and the YU Center for the Jewish Future. Focusing on medical and Jewish perspectives on pediatric mental and physical health, the conference covered topics that ranged from the controversy over immunizations to alcoholism and suicide rates within the adolescent Jewish community and how they differ from those of the general population. Featured speakers included Rabbi Dr. Edward Reichman, conference chairman, mentor of the MES program and professor of emergency medicine at the YU-affiliated Albert Einstein College of Medicine; Dr. Glenn S. Hirsch, medical director at the NYU Child Study Center; Dr. Barry Holzer, director of the Center for Attention Deficit Disorders; Rabbi Yaakov Neuberger, I. Meier and Henrietta Segals Chair in Talmud at YU’s Rabbi Isaac Elchanan Theological Seminary; Dr. David Pelcovitz, Gwendolyn and Joseph Straus Chair in Psychology and Jewish Education at YU’s Azrieli Graduate School of Jewish Education and Administration; Dr. Susan K. Schulman of Maimonides Infants and Children’s Hospital; and Dr. Yoni Schwab, assistant head of school at the Shefa School. 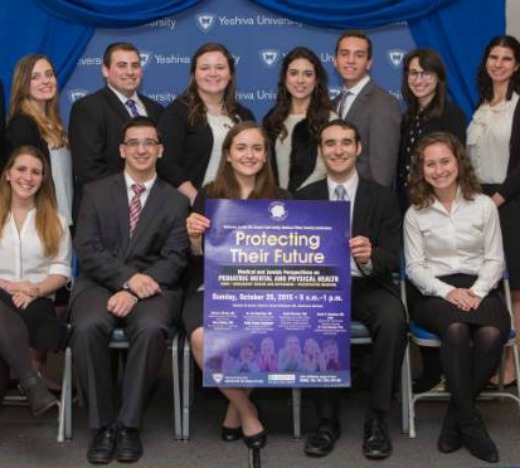 “The Student Medical Ethics Society provides our students with a unique opportunity to better our society by being active in convening the academic and Torah resources of our community,” said Rabbi Kenneth Brander, vice president for university and community life at YU and an adviser to MES. “Many people came up to me during the conference and applauded us for having the courage to openly discuss these topics,” added Garber.